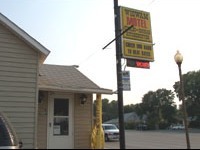 The Wigwam Motel is a 17 unit family owned motel, located within easy walking distance to downtown Cody stores and restaurants. All rooms were remodeled in 2005 and are non-smoking. Kitchenettes available year-round; non-kitchenettes have refrigerators & microwaves. Coffee and doughnuts are available every morning in the office. Small pets allowed with permission for an additional fee.